For the Baltimore Ravens assistant coach also nicknamed "Wink", see Don Martindale. 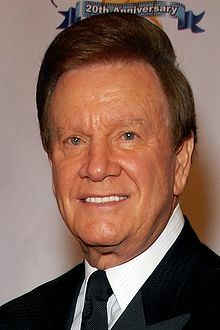 Winston Conrad "Wink" Martindale (born December 4, 1933) is an American disc jockey, radio personality, game show host, and television producer. In his six-decade career, he is best known for hosting Tic-Tac-Dough from 1978 to 1985, Gambit from 1972 to 1976 (and again from 1980 to 1981), High Rollers from 1987 to 1988, and Debt from 1996 to 1998. Martindale was born on December 4, 1933, in Jackson, Tennessee, and started his career as a disc jockey at age 17 at WPLI in Jackson, earning $1.02 a week. After moving to WTJS, he was hired away for double the salary by Jackson's only other station, WDXI. He next hosted mornings at WHBQ in Memphis while a college student at Memphis State University, graduating with a Bachelor of Science degree in 1957. While there, Martindale became a member of the Kappa Sigma Fraternity. On the evening of July 10, 1954, he was showing the WHBQ studio to some friends when he realized that his colleague on the 9 p.m. to midnight shift, Dewey Phillips, was getting a lot of reactions from auditors after airing a new song. That song was Elvis Presley's first record, "That's All Right", recorded at Sam Phillips' recording studio on the evening of July 5, 1954. Sam, who had brought the record on July 6, was in the WHBQ studio on the first airing night and had Elvis' telephone number. DJ Dewey Phillips wanted to interview Elvis during his program, so Wink endeavoured to contact Elvis, but his mother Gladys answered the phone and said Elvis was so nervous that he had been to a movie theater. Gladys and her husband Vernon brought Elvis to WHBQ and Dewey interviewed Elvis without his knowing that he was on the air (Wink reports that Elvis later admitted that he would have been unable to talk otherwise). Martindale's rendition of the spoken-word song "Deck of Cards" went to no. 7 on the Billboard Hot 100 chart and sold over a million copies in 1959. It also peaked at no. 5 in the UK Singles Chart in April 1963, one of four visits to that chart. It was followed by "Black Land Farmer". In 1959, he became morning man at KHJ in Los Angeles, California, moving a year later to the morning show at KRLA and finally to KFWB in 1962. He also had lengthy stays at KGIL from 1968 to 1971, KKGO/KJQI and Gene Autry's KMPC (now KSPN (AM)) from 1971 to 1979 and again from 1983 to 1987, the short-lived "Wink and Bill Show" on KABC during 1989, and KJQI from 1993 to 1994. In 1967, Martindale acted in a short futuristic documentary film about home life in the year 1999 produced by the Philco-Ford Corporation which predicted, among other things, Internet commerce. Martindale in 1964, as the host of What's This Song? Martindale's first game-show hosting job was on the show What's This Song?, which he hosted for NBC (credited as "Win Martindale") from 1964 to 1965. From 1970 to 1971, he hosted a similar song-recognition game show, Words and Music, again on NBC. His first major success came in 1972, when he took the emcee position on a new CBS game show, Gambit. He spent four years hosting the original Gambit and later hosted a Las Vegas-based revival for 13 months in 1980-81. The emcee role for which Martindale is most widely known is on Tic-Tac-Dough. He was tapped by Barry & Enright Productions to host the revived series in 1978 and stayed until 1985, presiding over one of the more popular game shows of the day. During this time, Martindale decided to branch out and form his own production company, Wink Martindale Enterprises, so he could develop and produce his own game shows. His first venture was Headline Chasers, a co-production with Merv Griffin that premiered in 1985; Martindale had left Tic-Tac-Dough to host his creation, but the show did not meet with any success and was cancelled after its only season in 1986. Martindale's next venture was more successful, as he created and, along with Barry & Enright, co-produced the Canadian game show Bumper Stumpers for Global Television and USA Network. This series aired on both American and Canadian television from 1987 until 1990. After hosting two short-lived Merrill Heatter-produced game shows (a revival of High Rollers and the Canadian The Last Word), Martindale went back into producing and launched The Great Getaway Game on Travel Channel in 1990. Two years after that program went off the air, Martindale teamed up with Bill Hillier and The Family Channel to produce a series of "interactive" game shows that put an emphasis on home viewers being able to play along from home and win prizes. Four series were commissioned and Martindale served as host for all four. The first to premiere, on June 7, 1993, was Trivial Pursuit, an adaptation of the popular trivia-based board game. On March 7, 1994, the list-based Shuffle and Boggle, another board game adaptation, premiered and were much different from Trivial Pursuit which was presented more in a traditional game-show style. These two programs, along with the Jumble-based show that replaced Shuffle on June 13, 1994, after its initial 14-week run ended, were played more like the interactive games for the home viewers that were the focus of the block. Except for Trivial Pursuit, none of the interactive games were much of a success; Boggle ended on November 18, 1994, while Jumble came to an end on December 30, 1994. Trivial Pursuit ended on the same day as Jumble, but continued to air in reruns for sometime afterward, finally being removed from The Family Channel schedule in July 1995. In June 1996, Martindale became host of Lifetime's highest-rated quiz show, Debt, which had debt-ridden contestants compete to try to eliminate their debts. Despite its popularity on cable, Debt was canceled in 1998, for the reason more males were watching the show, than females (the network's target audience). Martindale did not host another game show for over a decade. In 2008, Wink appeared on GSN Live, an interstitial program during the afternoon block of classic game show reruns. Several times during 2008, Martindale filled in for Fred Roggin on GSN Live while Roggin was on vacation. Martindale's last program was the GSN original series Instant Recall, which premiered on March 4, 2010. Instant Recall was the first show Martindale has hosted since Debt aired on Lifetime from 1996 to 1998. In 2013, Martindale made a quest appearance on The Eric Andre Show. In 2014, Martindale started his own YouTube channel, called Wink's Vault, featuring episodes of game shows, game show pilots, rare clips from various game shows, and more. On April 4, 2018, Martindale served as "surprise co-host" (via phone) for Sirius XM NHL Network Radio's "Three Questions" segment where a celebrity co-host creates the questions and then quizzes the show's broadcast crew. Martindale is a born-again Christian and was once a guest on the TBN flagship program Praise the Lord. Wink's wife, Sandy, dated Elvis Presley, and both were friends of his. They have appeared on Sirius' Elvis Radio and shared stories about Elvis. Baltimore Ravens defensive coordinator Don Martindale goes by the nickname "Wink" as a nod to Martindale. ^ On his Facebook page, many people wished him a happy 80th birthday, so he was born in 1933. ^ "1933-game-show-host-wink-martindale-who-went-to-no-7-in-1959-with-the". ThisDayInRock.com. November 6, 2015. Retrieved November 6, 2015. ^ Roberts, David (2006). British Hit Singles & Albums (19th ed.). London Land: Guinness World Records Limited. p. 352. ISBN 1-904994-10-5. ^ Auzenne, Ian (July 7, 2013). "The Weekend Guy's Picks: Six Game Shows That Should Be Revived". 973thedawg.com. Retrieved April 17, 2018. ^ "Earthworks Entertainment's Hit Parade Radio Signs Wink Martindale" (PDF). Retrieved February 17, 2010. ^ "Earthworks Entertainment's Hit Parade Radio Announces Launch Date on Clear Channel Satellite" (PDF). Retrieved February 17, 2010. ^ Sassone, Bob. "Wink Martindale to Host 'Instant Recall' on GSN Starting March 4". TV Squad (AOL). Retrieved February 5, 2010. ^ Davis, Alex. "Wink Martindale Hosts GSN's Instant Recall Starting March 4th". Buzzerblog. Retrieved February 5, 2010. Wikimedia Commons has media related to Wink Martindale.